A multitool is a portable hand tool that can perform many functions. These tools come in a variety of sizes, ranging from a key ring size to the larger belt- mounted pouch size. Multi tools also differ in the number of tools they have and the manufactured styling of those tools, so it is important to research before making a purchase. Will the tool be carried on a daily basis? Is the tool going to be fastened to a key ring, put in the pocket or carried on a belt fastener? Is the tool needed for a specific purpose such as hunting, fishing, camping, military, survival experiences or electrical work? The next consideration is the quality of the individual tools within the multitool. Quality is determined by factors such as durability, weight, ease of use, comfort and how effectively the tools function. Some of these quality points can be subjective, however there are key details to consider regarding the most common multitool components. Knife blade: The quality of the material used to make the blade is important. Stainless steel is a durable option and a properly treated stainless blade is usually reasonably priced. High carbon is extremely durable and requires more maintenance. A great third option is high-carbon (HC) stainless alloy because it provides the strength without the extra maintenance. Choosing a good quality steel blade will result in less corrosion and better edge retention. Another feature that is important is the strength and reliability of the lock on the knife blade. A faulty lock can be dangerous in situations where a knife is being worked under pressure. The size of the blade is based on the size of the multitool. A three inch blade is considered adequate for most multitool users. If excess tool weight is not a factor then the addition of a serrated blade can be handy for some applications. Some styles have a combination serrated and regular blade, but this option often results in compromising the functionality of each one and is not a feature in any of the top selling styles. Pliers: This is the second most popular tool included in the majority of multitools. The best tools have both needle nose and wider platform pliers. There are many models that combine the needle nose and wider pliers in one tool to save space and this does not compromise functionality. Check to be sure that there are wire cutters included in the mouth of the pliers. Scissors: Scissors come in handy because they are perfect for completing the more delicate jobs that a knife does not do with great accuracy. The scissors in your multi tool should be self-sharpening and have enough room in the grip for fingers to feel comfortable. Smooth operation and fluidity of movement are important and spring action scissors provide the best and safest cuts. Screwdrivers: Screwdrivers on a multitool are common and can be very useful in certain situations. Check for both Phillips and flat head screwdriver components as this will cover the bases for an emergency repair. If a screwdriver is a main component needed, such as with bike repair, there are many multitools with a more extensive variety of sizes and types of tips. 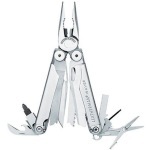 The most popular multitool on the market is the Leatherman New Wave. The value of this multitool is that it is packed with 17 quality tools at a price point below $100. 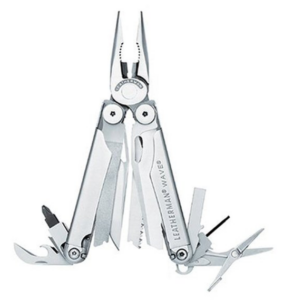 The versatility of the components and medium size (4-inch, 8.5 ounces) makes this Leatherman product a bestseller across the multitool market. A key feature that made the original Wave popular was the outside accessible blade that can be deployed with one hand. As the Wave was updated, the company improved features such as the size of blades and the strength of the pliers. They also improved overall safety by adding all locking mechanisms. The Wave’s knife blade (2.9 inch)is made of 420HC stainless steel and is optimized by heat treatment. An alternate coating that is offered is called a black oxide metal coating and it is effective in reducing glare and reflection. This would be an ideal coating for those in the military or any situation where giving away a position would be detrimental. 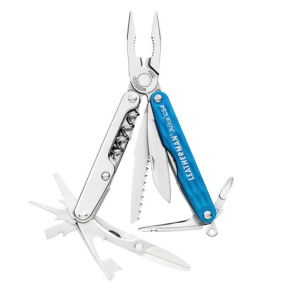 There are two sizes of small/compact multitools to consider: keychain and pocket sized. A keychain multitool is smaller and sacrifices some of the capability for the convenience of portability. A typical keychain multitool is not going to be able to handle heavy duty work. A pocket multitool is still portable although slightly larger in size. The pocket multitools are sturdier than a keychain multitool and they usual come with a more extensive tool set. When it comes to keychain multitools, the Leatherman Squirt PS4 is the most versatile and rugged model available. The extremely compact size of the tool (2.25 inches/2 ounce weight) is an asset because most keychain tool users want an item that will do the job when needed and stay out of the way the rest of the time. With a total of 9 tools and a price of $36, this highly functioning tool is perfect for everyday use. It makes an excellent gift for someone who might not carry a multitool in a pocket or on their belt. The Squirt PS4’s knife blade(1.6 inch)is made of 420HC stainless steel and is optimized by heat treatment. An aero-grade aluminum alloy 6061-T6 is used on handle scales in order to reduce weight without losing strength. There are a range of sizes that fit in the pocket carry category because these tools could ride in pockets or in a purse, briefcase or backpack. 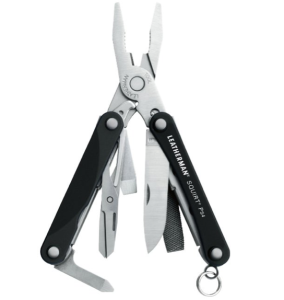 The Leatherman Juice CS4 is widely considered the top contender in this category because it combines a great deal of capability into a very compact size (3.25 inches/5.6 ounces). The Juice CS4 has 15 durable tools and is considered to be the pocket tool with the best combination of portability and design on the market. As an everyday carry tool, another important consideration is the Leatherman 25 year warranty. Consumers have praised the company’s fulfillment of their warranty plan for decades and this makes Leatherman products a worthwhile investment. The Juice CS4 knife blade is made of 420HC stainless steel that is optimized by heat treatment. The body is made of Type 2 anodized aluminum which is a porous coating that provides wear and corrosion resistance. Full sized multitools are designed to be rugged and capable of handling jobs that normally require regular tools. Designed with strength and longevity in mind, they are sometimes divided into two different categories: everyday carry and tactical purposes. 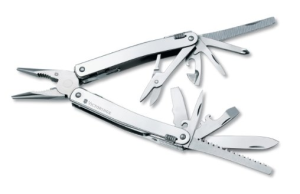 The best multitool in this category is the SOG Powerlock 2.0. 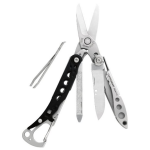 This large (7 inch/ 9.7 ounces) multitool contains 16 tools and technology that satisfies both every day and tactical categories. It also has cutting edge technology that is impressive. One SOG proprietary piece of technology that this tool comes with is Compound Leverage. 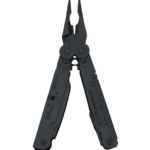 According to SOG, this “impacts performance by employing multiple pivot points that generate greater handle travel in relation to plier movement.” This is also the first multitool to have two SOG Assisted Technology blades that open with ease when engaged, a feature not widely available in multitools. When comparing the tools in this category, another aspect of the SOG Powerlock 2.0 that stands out is the ability to change the tool configuration and tailor it to individual needs. Every tool is replaceable and the prices for the individual components are priced at under $10 each. This model specifically comes with piano key design individual tool locks. This allows the user the convenience of engagaging one tool at a time. The SOG Powerlock 2.0 is a large multitool(4.6 inches/9.6 ounces) that is usually carried in a sheath on the belt. The knife blade and handle on the SOG Powerlock 2.0 is made of 420 steel and the tool finish is satin. The included sheath with secure clip is available in either black ballistic nylon with a hook and loop closure or leather with a belt through loop attachment. Famous for creating the Swiss Army pocket knife, Victorinox also makes a line of multitools that carry the same craftsmanship. The Victorinox Swiss Spirit X is considered the luxury version of the popular Leatherman New Wave multitool that I mentioned above. The Spirit X design is centered around a pair of pliers like the Wave, but also shares some of the functionality of the iconic Swiss Army knife tools. The tool size is the same as the Wave at 4.1 inches, however the lighter weight (7.3 ounces) makes a difference in terms of comfort and everyday carry. The main comparison points addressed between the two boil down to the craftsmanship of the individual tools and the precision of the metalwork. For example, the Spirit X scissors are easier to use and the pliers are much smoother in action. The tool comes with individual springs so each tool can be opened one at a time and they can be opened from the outside without engaging the pliers. 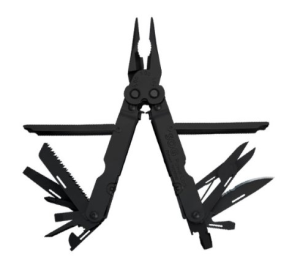 Although some people might question spending more on a tool that functions the same as the Leatherman New Wave, the distinction is clear for multitool enthusiasts. Those who use a multitool daily and appreciate superior craftsmanship understand that the Victorinox Spirit X is an excellent investment at approximately $115. Included with the purchase is a high quality, leather pouch. Victorinox tools also come with a Lifetime Guarantee that has been praised by generations of loyal customers. There are many great multitools on the market that are designed with specific jobs in mind. While they might not have all of the tools that are generally incorporated into the basic multitool design, they often have tools that are more useful for a specific application. Here is list of unique multitools and their features. Bike Enthusiasts: The Crank Brothers M17 is a great choice. This tool contains 17 features in one lightweight (under a half pound) tool. It comes packed with bike repair features such as a chain tool, spoke wrench, hex wrenches, screwdrivers and an open wrench. A lifetime warranty makes this an excellent investment at just $27.99. Communications Professionals: The Gerber Cable Dawg is a tool that was originally built for U.S. Military communications personnel. The tool is industrial strength and contains every tool needed to work with fiber optics, cable systems and IT. The list of tools is comprehensive: spring loaded wire cutters, CAT5 jack cutter, RJ45 crimper, wire stripper, locking knives, multiple drivers. This well developed tool can be purchased for as low as $200 on some non-manufacturer websites such as Amazon. Surfers: The Leatherman Thruster was engineered specifically for surfers. This multitool comes with a floating sheath and the tools pop into a polypropylene wax comb that fits in a pocket or hangs from a lanyard. The genius of the entire design is that the holder itself is a tool and it holds such necessities as a Phillips screwdriver, bottle opener, fin key, wax comb, was scraper, spring hook and lanyard hole. The low price point of $25 makes this tool an affordable necessity for every surfing athlete. Snowboarders: A partnership between the Leatherman tool engineers and Signal Snowboard designers, the Leatherman Hail snowboard tool was designed to be clipped onto a belt, pack or jacket. The features include a scraper, bottle opener, screwdriver, wrench, earphone storage and karabiner. At a price point of only $25 this is a fantastic lightweight tool that covers all of the bases on the slopes. Disc jockeys: With the amount of equipment a disc jockey already carries back and forth, it is important to have a multitool that contains everything needed to fix stands, trussing and cases. The DJ Multi- Tool folds down to a very compact 3.5 inches and contains Phillips/flathead screwdrivers, socket hex wrench rods, six hex key wrenches and a solid wrench tool. This hard working tool is a steal at just $24.99. Medical technicians: Keeping tools in the hands of those that are qualified to use them is a great idea. 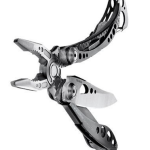 The Leatherman Raptor Shears Medical Multitool was designed with the help of EMT personnel, medics and firefighters. It includes 420HC stainless steel folding medical shears, oxygen tank wench, strap cutter, ring cutter, ruler and carbide glass breaker. Most people in the medical field would consider the $69 price point a reasonable investment for tools that are priceless in an emergency situation.